I finally did it. After 5 years of trying, I won the KC Commuter Challenge. It is that time of year again. Time to put away all gas powered vehicles and use only human powered ones during our daily lives. Day 1: Plan was to meet Dave and Mark at 68th and Greenhills. Neither showed so at 5:30 am I headed South to work. Nothing eventful happened on the way in. Tonight it is going to be in the high 80's, but I should have a tail wind to aid me..... My route is just over 30 miles one-way and is the safest route to the Stowers Institute that I can find. Most of the roads I use have very little traffic (at least at 5:30 in the morning :-)) and miss the major intersections. I don't want to be added to this LIST. Nothing eventful happened on the way in. Tonight it is going to be in the high 80's, but I should have a tail wind to aid me.....Great ride home except for that jerk Red Neck that yelled at me as he drove past. He then tried to run me off the road after I politely said "Good Afternoon to you" as I rode past him along the shoulder when he got stuck in traffic. Good times for sure. Day 3: Rode in today by myself. I received a call around 5:38am from Mark Sperl, but was already heading into North KC by that point. It was a little chilly today, but I'll take a cold morning over a rainy one any day. Nothing special on the ride in except I nearly fell asleep while riding. All this riding and walking is taking its toll.....Walked over to Taco Bell for lunch today. I'm eating more today so hopefully it will help my energy level.....Dave and I had a great ride home today despite the wind. This was my first ride this week that I actually felt good. Day 4: Great ride in today. A little cold at first, but once I warmed up I was fine. No one showed up to ride in with so it was another solo effort. I'm either getting in better form or I'm like an old horse that is close to the finish of a journey and starts to get rejuvenated.....met Dave on the way home today. He was on his new Kestrel TT bike. He is crazy to be commuting on a TT bike. The ride along Kessler was very nice today. I wish we had more roads like this in KC. At about the 1/2 point my rear wheel started to feel funny. After a few miles we stopped to see what it was. Turns out the kevlar casing had broke and cased the tire to "deface". I took a chance and rode it home. 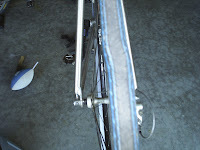 By the time I got there a small part of the tube was coming out of the sidewall. I'm glad the trip home was only 31 miles because I wouldn't have made it one more. 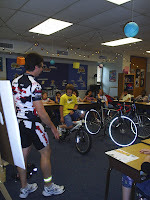 Since May is National Bike Month, I decided to organize a few bicycle safety presentations at area schools. Actually this first presentation was organized by Carolynn Locke and Lori Riddle, Christopher's 5th grade teacher. Dave Wathen, VP of Cow Town Cycling, and I were suppost to present these Bicycle Safety Clinics using the presentation Dave has used over the last year. At the last minute Dave could not come so I had to put something together on Monday evening and give the presentations by myself Tuesday morning. Linden West Elementary was the location of my first presentation. Actually it was not that bad. I gave 3 presentations and each one got a little easier, but the questions the kids had did not. 1. Why is your shirt so tight? 2. Why are your legs so big? 3. 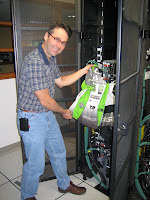 Why is Slime green? 4. 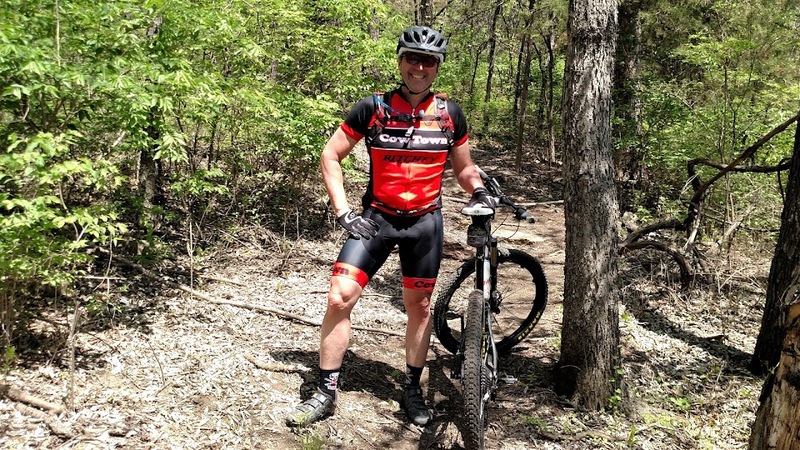 What are those funny looking pedals? 5. Why don't you just ride to work like my mom?